When I was deciding which cupcake recipes to have on the site, Coconut Cupcakes (also known as Snowball Cupcakes) were at the top of my list. I love both the look and flavor of these little buttery cakes covered with a tangy cream cheese frosting and flakes of coconut. For Spring, I often like to dress them up to look like little Easter baskets, complete with colorful handles, and candy Easter eggs. Coconut Cupcakes start with a sweet and buttery white cake batter. The creaming method is used, which means you beat the butter with the sugar, followed by adding the eggs, flour, and milk. The flour and milk are added alternately, as I find this method prevents over mixing so we end up with wonderfully light and fluffy cupcakes. Next, the batter is divided among 12 muffin cups and baked. Always check the cupcakes a few minutes before the end of baking, as the first time you check the cupcakes you want there to be a few moist crumbs clinging to the toothpick. That way you know they are also done. Because while the toothpick test does indicate the cupcakes are not under baked, a clean toothpick can mean that the cupcakes are already over baked (resulting in a cupcake that is dry tasting). The cupcakes need to be completely cooled before they are frosted. Now, you could use a confectioner frosting on these buttery white cupcakes, but for a change I decided to use a cream cheese frosting. 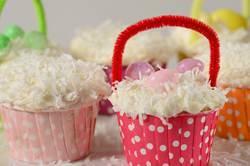 It has a smooth and tangy flavor which seems the perfect accompaniment to, not only the cake, but the coconut garnish. You can use either sweetened or unsweetened dried coconut. My personal preference is unsweetened coconut, either flaked or shredded. Sweetened coconut is made by combining coconut with powdered icing and is packaged either in plastic bags or cans. Unsweetened coconut (dried coconut) can be found in some grocery stores, specialty food stores, and health food stores. Note: The cupcake liners (nut cups) are from bakeitpretty.com. Coconut Cupcakes: Preheat oven to 350 degrees F (180 degrees C) and lightly butter or line 12 muffin cups with paper liners. In a bowl sift or whisk together the flour, baking powder, salt, and lemon zest (if using). In the bowl of your electric mixer, or with a hand mixer, beat the butter until soft (about 1-2 minutes). Add the sugar and beat until light and fluffy (about 3-4 minutes). Scrape down the sides of the bowl as needed. Add eggs, one at a time, beating well after each addition. Beat in the vanilla extract. Then, with the mixer on low speed, alternately add the flour mixture (in three additions) and milk (in two additions), beginning and ending with the flour. Beat just until combined. Evenly fill the 12 muffin cups with the batter and bake for about 18 - 20 minutes or until a toothpick inserted into a cupcake just comes out clean. (Do not over bake or the cupcakes will be dry.) Remove from oven and place on a wire rack to cool completely. With a knife or spatula, spread frosting on each cupcake. Garnish with coconut (sweetened or unsweetened, shredded or flaked). These cupcakes are best the day they are made but they can be stored in the refrigerator for a few days. Bring to room temperature before serving. Cream Cheese Frosting: In an electric mixer, or with a hand mixer, beat the butter until smooth. Add the cream cheese and beat until smooth and well blended. Beat in the vanilla extract. With the mixer on low speed, gradually beat in the sugar. Scrape down the sides of the bowl as needed. Beat on high speed until frosting is light and fluffy and of spreading consistency (about 3 minutes). Add a little milk or cream if frosting is too thick.